After nearly 3 years of moving back to the U.S. from Madrid and years of giving (people traveling to) Madrid tips and advice, I am FINALLY getting down to writing this blog post about everything a person visiting Madrid for the first time should know. While living there, I took advantage of everything Madrid had to offer. From its expansive food scene, to its vibrant nightlife and to the million and one shopping opportunities—looking at you Primark, Bershka and Stradivarius. I tried to be in the truest sense of the phrase I could be, a true Madrileña. 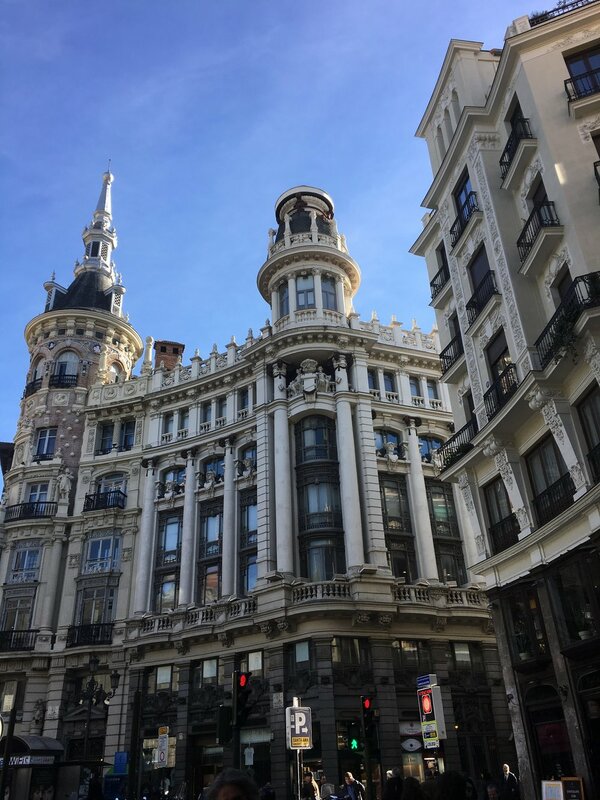 So here is my gift to you—everything I learned in my time in Madrid and everything to ensure your first time in Madrid is nothing short of perfect (perfectly planned that is)! Oh Madrid—a place I called home for such a huge turning point in my life. I may or may not be biased, but Madrid is one of the most beautiful and vibrant cities in the world. Before living here, I had never seen a city so filled with hundreds and thousands of years of culture and history, coupled with a boisterous nightlife unlike any other. Madrid has some of the most beautiful architecture I have ever seen! Madrid is one of Europe’s most historically rich cities. Its documented history traces back to the ninth century, but the area in fact has been inhabited by humans since prehistoric times and there are actually traces of this in the city! Numerous ancient objects have been uncovered in excavations along the banks of the Río Manzanares, such as axes and large mammal remains—crazy right?! Madrid was actually called Mayrit when it was founded and occupied by the Arabs. From there, the city was passed between Muslim and Christian hands multiple times (which is why you will see so many symbols of influence throughout the city of these occupations). This is also one of the reasons why Madrid, along with the rest of Spain has so many influences evident in their present day culture. For example, any Spanish word starting with the prefix “al-” actually comes the Andalusian Arabic language (the Arabic of the Iberian Peninsula). The word “almohada” meaning pillow in English originates from the Andalusian Arabic word “mijadda”, which became “al-mujadda” in Andalusian Arabic. Last day of classes at URJC! After dictator Francisco Franco’s death in 1975, his successor, Rey Juan Carlos I guided the country back to democracy and opened Spain up to the world after years of repressive dictatorship creating the Madrid we know today. 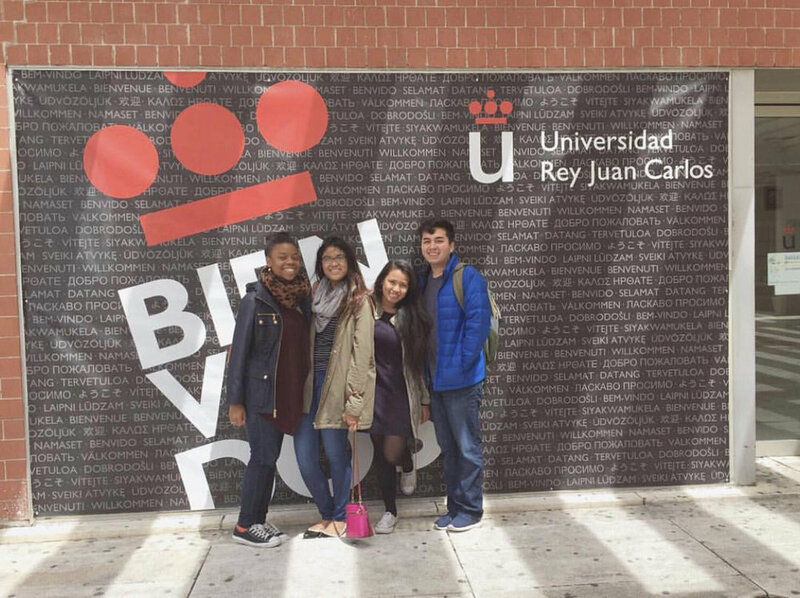 The Uni I attended was actually one named after the King—Universidad Rey Juan Carlos! Fun Fact: Madrid was not always the capital of Spain! Toledo was actually the capital of Spain for the longest time, until the Spanish Constitution of 1978 confirmed Madrid as the capital of Spain. Madrid has one of the best (and cleanest) public transportation systems in the world. Although it does close from 1:30 am to 6 am, it is very efficient and is pretty good about always being on time (looking at you NYC MTA). Pretty much everyone in Madrid uses the metro as it is literally everywhere. If not the Metro, people use the Metrobús which is also very efficient (and has WiFi on board)! If you plan to leave the city center (Gran Via and Sol area), I suggest using one of the two instead of a taxi as the taxi’s in Madrid do get pricey. Note: Madrid Metro closes at 1:30 am and re-opens at 6 am. However there are night buses that leave from Cibeles! Madrid is filled with some of the best (and my personal favorite foods) in the world. I will not be including a list of suggestions on this post as I have created a whole blog post of just recommendations, but I will list some must try foods. Remember the culture of sharing is huge in Madrid, so get ready to share everything you order! I have included an extensive food list in this blog post that are some of the best places to eat at in Madrid! A typical night out in Madrid—entrance to clubs always came with free drinks! Nightlife is such a big part of the Madrid culture as it is one of the best scenes for nightlife in all of Europe. Menu del Día is a very big thing in Spain, but most especially in Madrid. What it is is essentially a 3 course meal (typically at lunch) including an appetizer, main course and dessert accompanied with a drink all for a very low cost. I typically paid around 9-12€ for my menu’s, but there are fancier options. Pretty much every restaurant offers this during lunch time! Means yes, okay, acknowledgement, to fill a space after a sentence—point is they use it a lot! Me voy, vale? Vale, te vas también? Vale vale vale. This is such a common misconception among English speakers trying to speak Spanish in Madrid so to clear the confusion: Menu short for Menu del Día is a 3 course meal I was talking about above. A Carta is what you as an American think is the menu. So if you do not want the 3 course meal, ask for la carta por favor and not the “menu”. The English language has so many different words to describe how great something is— “How cool, awesome, nice, amazing, etc. !” Spanish has significantly less, in fact this phrase encompasses all of that and Madrileños use it very frequently. Want to fit in with the Madrileños? Ask for a caña instead of a cerveza—yes the bartender will understand when you ask for a cerveza, but everyone in Madrid refers to it as caña. Remember how I mentioned in my 14 Things You Need to Know Before Traveling to Madrid blog post that people in Madrid are very relaxed people? Well this goes hand in hand with that. Literally the phrase means “nothing happens,” but really is used in situations where you are trying to say “No worries” or “Not a big deal.” You will find Madrileños will say this A L O T. Miss a bus? No Pasa Nada. Can’t go out tonight? No Pasa Nada! Forget something? No Pasa Nada. 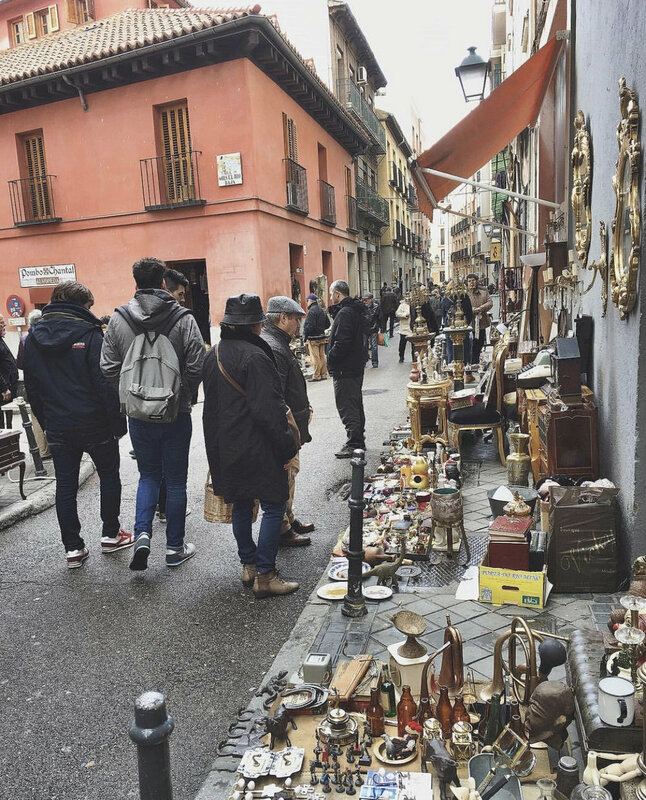 El Rastro Flea Market on Sundays! One of the oldest areas in Madrid known for its many tapas bars. It is super lively on Sunday nights. This was my favorite place to go to on Sunday nights as this is when it comes alive. It is also where El Rastro (flea market) is on Sunday mornings. Where all the trendy bars, cafes and restaurants are located. It is also known as the LGBTQ neighborhood of Madrid—you will see pride flags everywhere. Most culturally diverse neighborhood in Madrid. You can find so many different international cuisines here, hip bars and cafes and amazing street art—they even have street art tours here! *Madrid is notorious for pickpockets. A lot of my friends got their phones stolen while we were living in Madrid—especially on the metro. It is a beautiful and very safe city, but just be very careful and cognizant of your belongings! -Look for places that have Menu del Día—they are everywhere in Madrid and you get a 3 course meal for around 9-13€ *drinks are included too! -DO NOT take a taxi from the airport to your Airbnb, there is a 30€ flat rate and its not worth it (most places from the airport do not even cost that much)! Take the metro instead, Madrid Metro is amazing and easy to navigate. -Stay away from the Romani kids who ask you to “sign” a petition as they are typically pickpockets (ESPECIALLY in- Sol, Gran Vía, and Plaza Mayor). While you are “signing” their petition, they will use this time to steal your wallet. Well there you have it! Everything you need to know for your first time in Madrid in this First Timer’s Guide to Madrid. Hope this helps you in some way!